Time to debut a new feature: The AU Threat Level. Which comes your way each week on either Wednesday or Thursday (depending on the schedule). Pretty simple. the higher the threat level. The higher Auburn's chances of making serious headway this year. 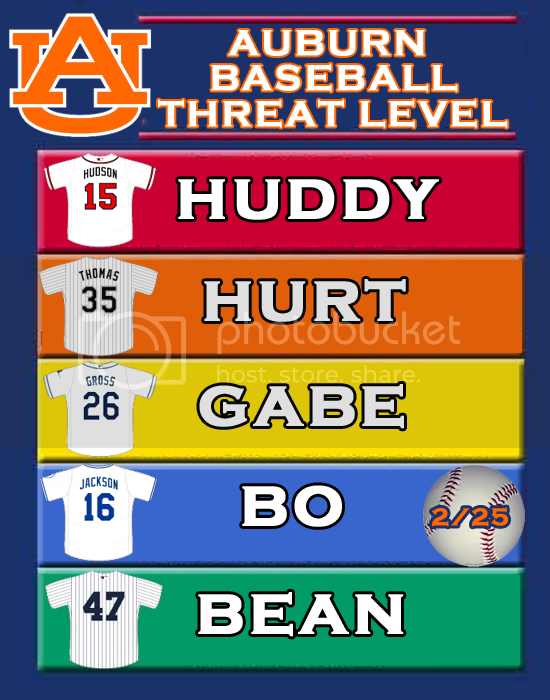 Personally, I don't see Auburn getting high than "Threat Level Hurt". Here's a quick breakdown. Threat Level Huddy Named for Tim Hudson. Current Major Leaguer and the driving force behind Auburn's best baseball season (1997). Team has all the elements and tools needed to make it to the College World Series. Majority of Players are playing at an All-SEC and All American level. Threat Level Hurt Named for Frank Thomas, aka "The Big Hurt". Team has power and decent pitching. Super Regional bound. A few players playing a All American level. Most playing at All-SEC level. Threat Level Gabe Named for Gabe Gross. At least two players playing at All-American level. A few at All-SEC level. Regional bound. Decent Major league talent. Threat Level Bo. Some players are destined to be Auburn legends. No All Americans. A few All-SEC. Power heavy. SEC bound. Before you argue over why Bo Jackson is so low; remember this. Bo Jackson was never an All-American in baseball. Gabe Gross was. Weird I know. Threat Level Bean. Named for Colter Bean. Team has to scratch and claw to make headway. A few guys handling the majority of the load. Some guys could rewrite a few AU records and be remembered a few years later. SEC bound at best. Neat idea and a nice graphic. It's good to see a serious Auburn baseball blog.